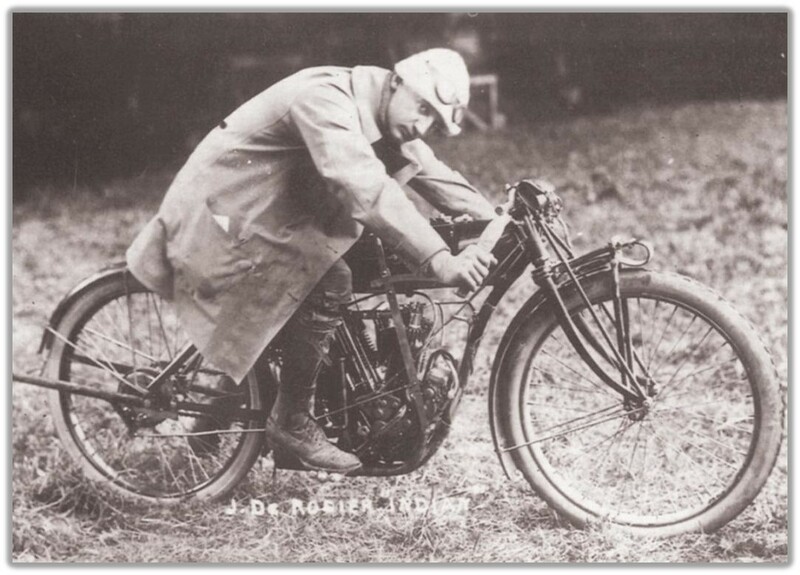 One hundred years ago, Jacob DeRosier was the most successful motorcycle racer of his time. He was perhaps the world’s first factory-supported rider and was reputed to have won close to 900 races in his short lifetime. His career spanned the period of transition from early motorized bicycles to the powerful racing machines of the board-track era. DeRosier was born in the tiny Quebec village of St. Ulric, east of Rimouski, on Dec. 10, 1879 and moved with his family at age four to the United States. They lived in Massachusetts, home to the pioneering Indian factory which was located in Springfield. Bicycle racing was all the rage and Jake became one of the top bicycle riders in New England by the age of 18. He was exposed to early developments in motorcycles when Henri Fournier arrived from France in 1898 with large-engined two-wheelers that were used for pacing bicycles and helping them achieve higher speeds. DeRosier persuaded Fournier to let him try one and demonstrated such skill that he was hired to ride the machines at bicycle races in Paris. By the turn of the century Jake had a reputation as one of the top cycle pacers in the United States. 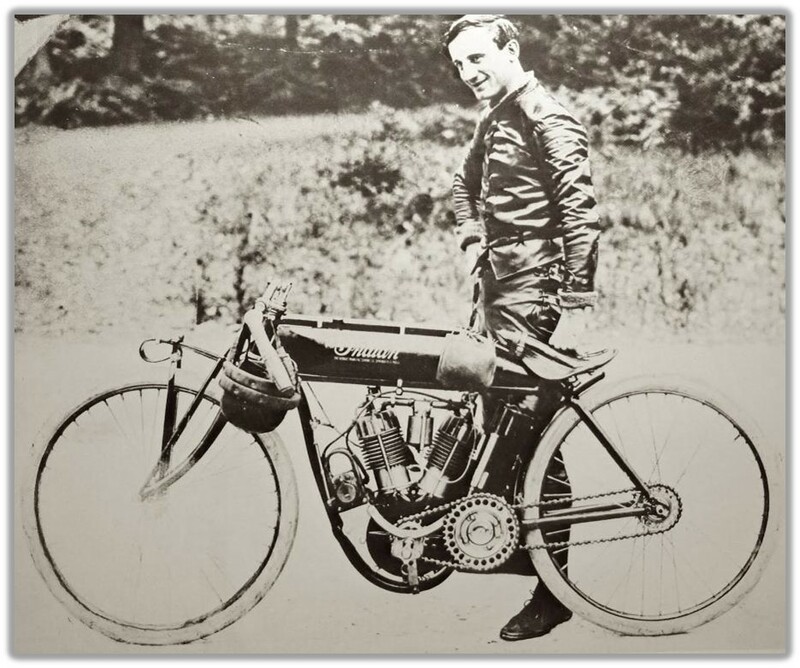 In 1901 DeRosier was pacing a champion bicycle racer named John Nelson when he met Oscar Hedstrom, a brilliant engineer and co-founder of the Indian Motocycle Company, who at the time was building his own design of gasoline-powered tandem pacing machines. Jake was invited to join the fledgling Indian works. Although he remained there as an employee only a few months he continued to ride Indians in competition, as the company’s founders supported racing from its earliest days. Those early events consisted of road races, dirt tracks and the gently banked velodromes built for bicycles. As speeds rose rapidly in the early years of the 20th century, the shallow 25-degree bankings gave way to larger tracks with much steeper corners of up to 60 degrees built of wooden planks. Spectators were seated in bleachers at the top looking down on the action but vulnerable to out-of-control machines flung upwards by centrifugal force. They shared the danger with the riders who wore little protective gear. Board-track motordrome racing was a risky endeavour for all concerned. In 1908 DeRosier won the national championship of the Federation of American Motorcycles and enjoyed a full-time sponsorship from the Indian factory. He was also being paid by race promoter Jack Prince to ride at the opening of new board tracks that Prince was building across the U.S.
Jake’s best year was 1911 when he held every FAM speed record for professional riders. The same year he formed part of a five-man Indian team sent across the Atlantic to contest the Isle of Man Senior TT race. He led the first lap around the 37-mile circuit but crashed on a subsequent lap, eventually finishing in 12th place though he was then disqualified for receiving outside assistance. His English teammate Oliver Godfrey led an Indian sweep of the first three places. Before returning home DeRosier took part in a series of match races at the banked Brooklands track in England where he won two out of three races against British champion Charlie Collier on a Matchless. DeRosier’s return to the U.S. was marked by a disagreement with Indian president George Hendee and Jake left Springfield to ride for Excelsior, based in Chicago. Excelsior was out to make a name for itself under new owner Ignaz Schwinn and its V-twin racing machines became almost unbeatable. DeRosier and others in the Excelsior team travelled to California in Feb. 1912 to race at the opening of a new 1/3 mile motordrome in Los Angeles. One of his teammates and a personal rival was a California rider named Charles Balke, known as “the fearless one,” prompting the race promoter to stage a series of match races between the two. They ended in a brutal crash when Balke fell and his bike brought down DeRosier, who was injured far worse than Balke. After a long hospital stay, and being transported back to Massachusetts to recover, DeRosier died in Springfield on Feb. 25, 1913. His funeral drew hundreds of spectators and work in the Indian factory stopped as the procession passed by, as a salute to the greatest rider of the day. Jacob DeRosier has also been inducted into the American Motorcyclist Association Hall of Fame and the Canadian Motorsport Hall of Fame. Jacob Derosier passed away in 1913.